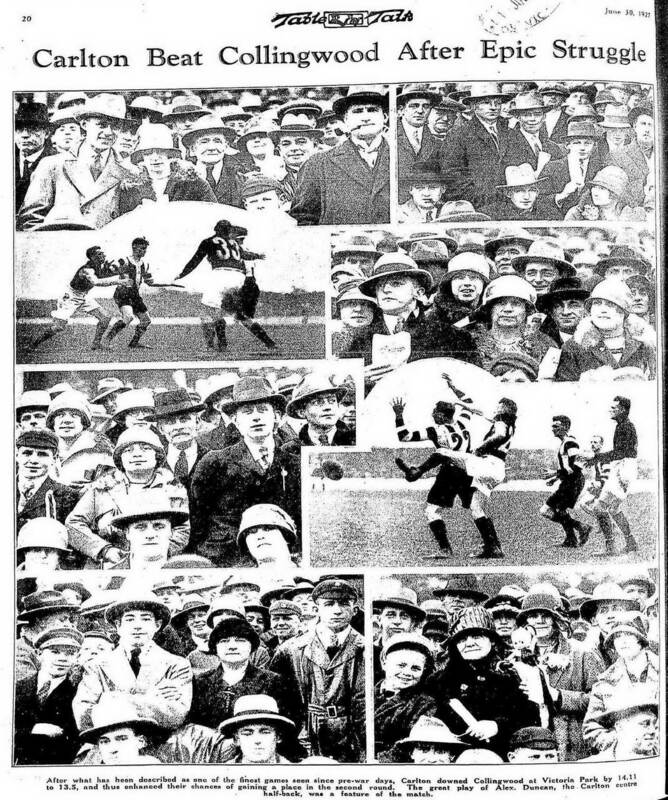 Sporting Globe 27 April 1935: p8 (Edition1). 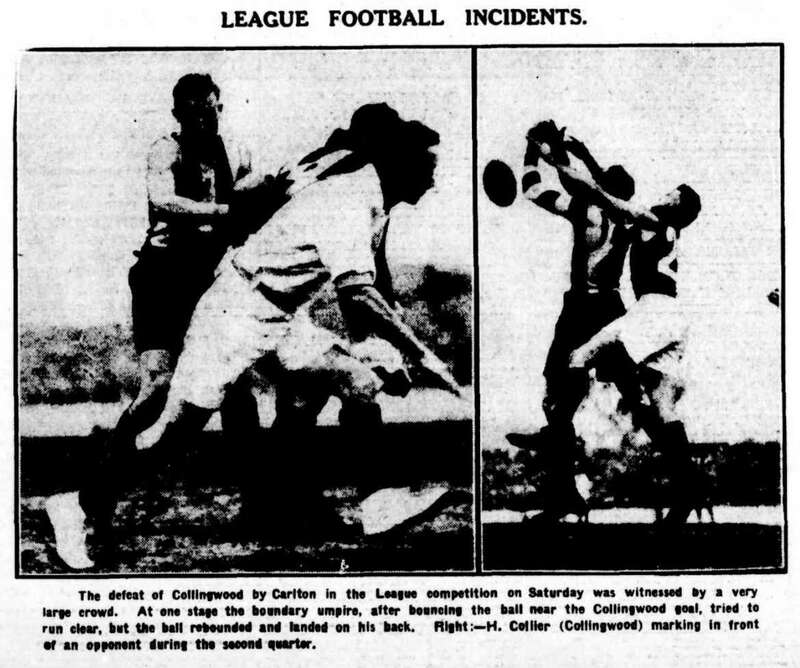 Many a thrilling football drama has been enacted on League grounds down the gamut of years. Probably the most stirring have been staged since the war, with the tremendous speeding-up of the game. As a football write for The Sporting Globe, I have been an eye witness of many sensational matches, and will re-tell the stories in a series of articles, the first of which now appears. It describes Alex Duncan’s great match, in which he paralysed the all-conquering Collingwood “machine.” The second story will appear in The Globe next Saturday. “DUNCAN’S MATCH!” Two words, ablaze with imperishable fame, that stand out vividly in Australian football history. They tell of an epic battle of giants and the most phenomenal individual triumph of modern times in a game between two powerful, first-class teams. 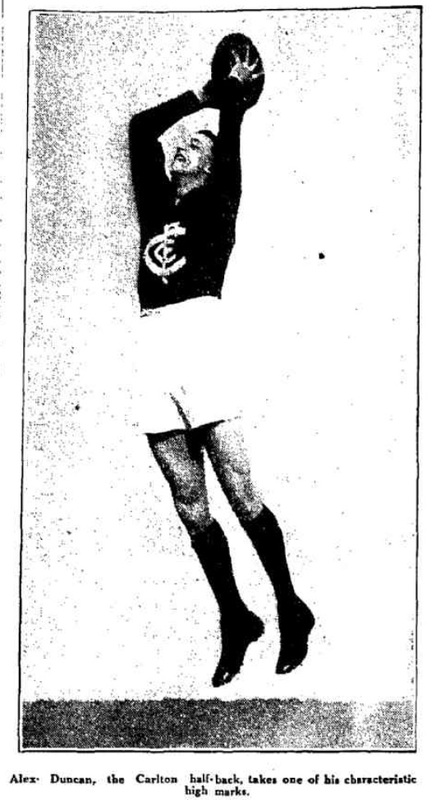 For, if ever one player swayed a match, Alex Duncan, with irresistible marking, did it for Carlton against Collingwood, at Victoria Park, on Saturday, June 25, 1927. Duncan had never played such a game before. He has never played such a game since. It was just one of those inspired, superlative things that a footballer does once in his lifetime, and no more. Players, of course, have often dominated one-sided or less important contests, but never, down the years from even the dimming past, has one player so dominated a clash of champion sides as Duncan did in that magnificent struggle that thrilled 33,000 cheering onlookers. As the players, exhausted and perspiring, staggered into their dressing rooms after a memorable match, thunderous applause shook the ground, with a special “tiger” for Duncan, the hero of the day. The great crowd unanimously agreed that never before had they seen such a stirring contest, nor such an amazing individual performance as Alec Duncan’s. Melbourne rang with his praises that night and many days afterwards. Everybody called it “Duncan’s match.” The name fitted like a glove. The chief merit of Duncan’s deeds lay in the calibre of the opposition – always the acid test. Collingwood, mid-way through the first of their four successive premiership seasons, were undefeated, with eight straight wins. They were sweeping all before them so ruthlessly that they had been nick-named “the machine.” They were a tough, systematic band, with plenty of brains – and weight. They had a liberal blending of big, determined chaps – Syd Coventry, Rowe Makeham, Poulter, Clayden, Rumney and Gordon Coventry, to mention only seven. Such was the class of opponent that Carlton, fifth on the list, with six wins and two defeats, tackled – and in the Magpies’ stronghold, too. A mighty roar and the game had started at breakneck speed. 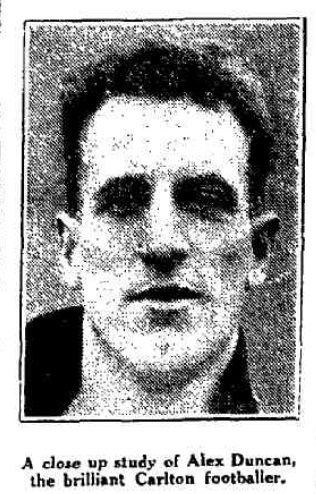 Alex Duncan, a shade over six feet and 13 stone, and supple and lithe, was in his usual half-back position with Donoghue and Beasy on his flanks. Minding Duncan was lion-hearted Frank Murphy, who mercifully did not know of the thunderbolt in store for him. Against Richmond a few weeks previously, Duncan, marking gloriously but kicking indifferently, had given a hint of his hitherto unsuspected greatness. Many, knowing Duncan’s tendency to inconsistency, had dismissed it as a flash in the pan. But it heralded a coming storm – a veritable tornado – for Collingwood forwards. From the first bounce, Duncan played like a man possessed, shattering attack after attack with miraculous marks, and snatching the ball out of the air, above the eager, outstretched finger-tips of friend and foe alike, like some huge vulture swooping on its prey. The ball would be flashed towards a jumbled mass of players. A dark blue figure would soar gracefully with arms shooting upward to haul down the ball in a gorilla-like grip. “Duncan again!” The crowd got hoarse from shouting it. Even in the first few minutes of the game Duncan sent the Magpies reeling back with four great marks. And he was only warming up! He marked in every conceivable way and position, rushing forward, upwards, sideways and even tilting back! Simply unable to do a thing wrong, Duncan, throughout the match, marked unerringly at mountainous heights – often against heavy odds. Timed with uncannily perfect judgement, his panther leaps almost invariably ended with the ball securely locked between his sensitive, steel-like fingers, to the utter stupefaction of baffled opponents. That incredible mark in the third quarter, when Duncan, as though propelled by an invisible force, glided high above the seething crush, will live long in the memory of all privileged to see it. It left the crown gasping. Duncan threw a spanner into “the machine” that day with a vengeance. He paralysed it. Not only invincible in the air, he also kicked and dashed forward like a champion of champions, saving innumerable goals, and repeatedly helping his side to score. Collingwood managed to dodge Duncan a bit in the first quarter and led by 6-1 to 4-0 at the change; but after that Duncan, with uncanny anticipation, was here, there and everywhere – a sinister, merciless figure to the hapless ‘Woodsmen’, who were slowly but surely worn down, Carlton winning by 14-11 (95 points) to 13-5 (83 points). The mighty Magpies had met their first defeat! Duncan had done it! “We had the call in the air, thanks to Duncan’s phenomenal performance; he is a super-footballer.” said Horrie Clover, his captain, after the match. Duncan, now captain and coach of Coburg, has lost some of his former brilliance, but is still a useful player. He first played for Carlton in 1921, as ruck man and forward, having come as a recruit from the small country town of Romsey. 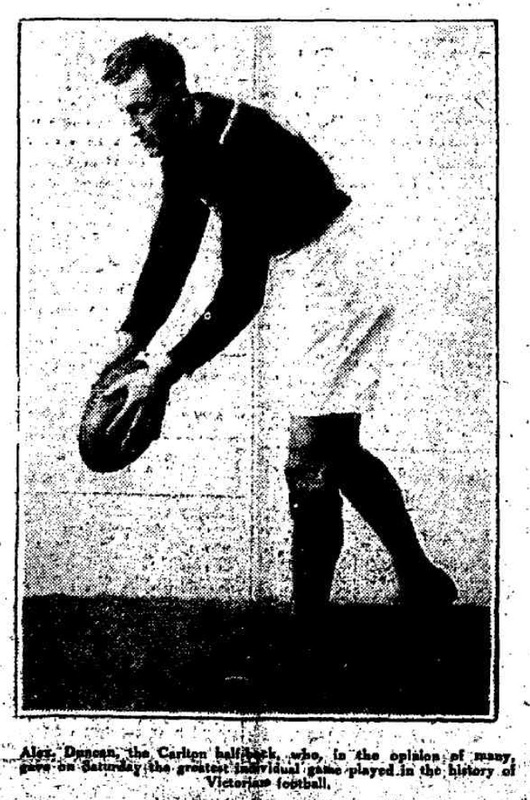 In 1925 he coached Stratford, a Gippsland team, but returned to Carlton next season. In his early days with the Blues he was an erratic sort of player, doing brilliant things one minute, and often spoiling them the next. In 1927 however, he had thoroughly settled down, and undoubtedly reached his dazzling zenith in that season.